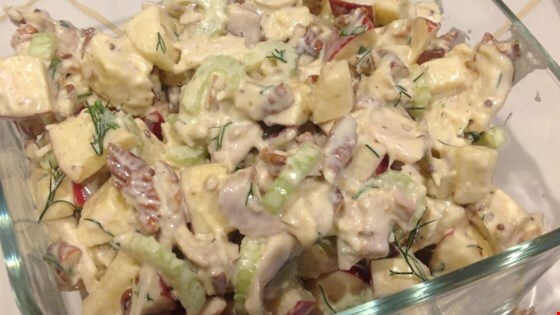 "Fill pita bread or line plates with lettuce and place scoops of this crunchy apple, celery, walnut and turkey salad on top. " Prepare the dressing in a small bowl by whisking together the sour cream, mayonnaise, parsley, lemon juice, honey, mustard, salt and pepper. Pour over turkey mixture and toss to evenly coat. Refrigerate until chilled. Crunchy Mexi-style for turkey leftovers. Not a favorite with the family. Something was a bit odd with the flavors. Won't be making this one again. A very tasty dish, brought raves from my office. Very easy to make ahead and bring to a potluck. I doubled the amount of mayo & sour cream; it seemed dry.